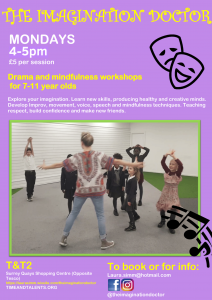 Drama and mindfulness workshops for 7-11 year olds. Explore your imagination. Learn new skills, producing healthy and creative minds. Develop improv, movement, voice, speech, and mindfulness techniques. Teaching respect, build confidence and make new friends.